Hello again! A few days ago i posted my first installment of my current indie favorites( found here: https://indienailblog.wordpress.com/2013/06/23/current-indie-favourites-1-digital-nails/), so today it is time to show you another of my favorite indie brands! Introducing the perfectly named I Love Nail Polish or ILNP/I<3NP for short 🙂 My favourite thing about this brand has to be the professional quality, and how this is beautifully mixed with indie shades. You feel like you’re getting the best of both worlds, a high quality salon polish and a unique indie glitter/shade. I decided to show you 4 pictures, all showing different types of polishes available by ILNP. The first, ‘Sniffany’ is one of many creams. The second, ‘Glass Slipper’ is a glitter topper. 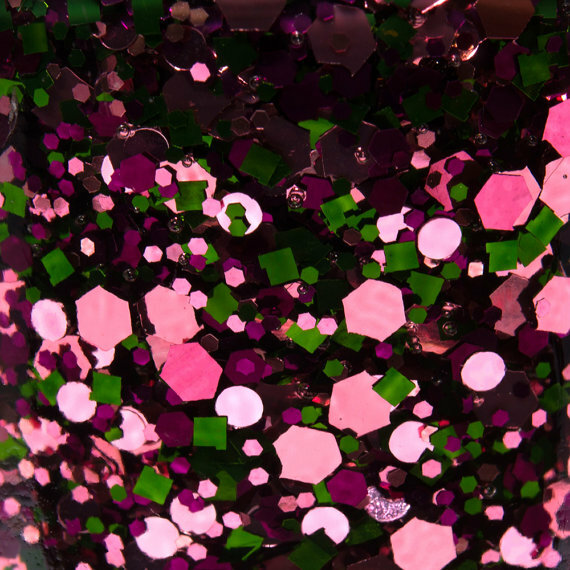 The third, ‘Army Surplus’ is a holo, and last but not least the fourth, ‘What the Funk’ is a glitter with a cream base. ILNP also do glitter jelly polishes i believe. ILNP are well known mostly for their incredible holographic polishes. I have seen a ton of holos by indie polish makers but none compare ( besides perhaps those in the Digital Nails store). The amount oh holographic pigment in these polishes is insane, and offers a sophisticated but fun look! A few of these holos are actually very subtle and office friendly including ‘Cashmere Sweater’, ‘A Touch of Mint’ and ‘Down Comforter’. My toes look VERY similar to the middle swatch which is entirely coincidence! I just decided on a lilac base to make the colour pop…it was between lilac and light pink. Now i’m going to leave you with a gorgeous image of the print used on the ILNP tissue paper for packing.